Bible Answers: Was the Eye of the Needle in Mark 10:25 a Literal or Figurative description and what does it mean? Ver 2.0) I recently received a question about what Jesus meant concerning the “camel” going through the “eye of a needle” spoken to us in Mark 10:25. This is a commonly misunderstood verse in the Bible that is often misused and misapplied to mean many things that was not truly stated. If we read the surrounding verses we might discover that there were two primary subjects being spoken of. One subject was salvation and the other was physical money or possessions. Jesus actually taught more on the subject of money than practically any other subject found in the Gospels. It is very obvious to me that this makes money a very important subject to learn and understand correctly. It further teaches us if money was discussed in the same context as salvation that we are required to learn how they fit and work together to have any confidence that we are following the words and teachings of Jesus accurately. This is a potentially controversial topic to teach. There are so many strong opinions on this subject of money and they go from one extreme on the far left to the opposite extreme on the far right. This subject will be difficult for some to receive but please do not get offended by anything that I say just because you disagreed. To become offended at your brother for saying something is a childish carnal reaction. If you want to grow spiritually and discuss it in a mature Christian way, I will be happy to hear what you have to say if you have Bible verses that back up what you believe. Mar 10:25 It is easier for a camel to go through the eye of a needle, than for a rich man to enter into the kingdom of God. The question being answered today “Is Jesus talking about a literal sewing needle in this verse or one that is figurative representing something else?” I guess that also implies, is Jesus talking about a literal camel in this verse or is the camel also a symbolic representation for something else? If one is symbolic the other by direct association must also be symbolic and the antithesis to that truth is if one is literal then the other reference must also be literal. Because the camel is stated to pass through the eye of the needle both objects must interact directly with the other. It is usually wisdom to be consistent in the interpretation of objects of such close proximity in the scriptures especially if they interact with each other. Determining whether or not these objects are literal or figurative will be a difficult question to answer so we need to use the defined rules of Bible interpretation to come to the proper conclusion. We will start with the rule of God’s Selected Word Usage in the other parts of the Bible to determine if God sets any pattern of usage or if God has presented us with any redefinitions for any of the words being questioned. This is actually one of the most significant Bible interpretation rules that is often ignored, not known or not applied. I hope that you at least understand the principle behind why this rule is beneficial. I’m not here today to teach rules for interpretation, but I will always use them whether I tell you about them or not. The Greek word G4476 translated as “needle” is only used in three verses in the entire N.T. and these all quote this same statement (Mat 19:26, Mark 10:25, Luke 18:25). This Greek word literally means a sewing instrument also known as a sewing needle according to the Strong’s dictionary. The Greek word G5168 translated as “eye” is also only found in these three same quoted statements in the same three verses in the N.T. The meaning of the “eye” is literally an opening like an orifice in the human body. Clearly this is a description of a literal natural sewing needle. Therefore, we have no other word usage convention in the N.T. to help us compare God’s selection of the terms to be either literal or figurative. That means we need to move to the next Greek word and learn what it teaches us. The Greek word G2574 that was translated as “camel” is used in the same exact three quoted verses but this word is also found in three additional N.T. verses where two times (Mat 3:4, Mar 1:6) it is definitely used by God to describe an actual literal created camel. In these two verses John the Baptist is described wearing a coat of “camel’s” hair and since John is literal the camel-hair coat must also be literal by the rule of direct interaction that I mentioned previously. There is only one other verse (Mar 23:24) in the N.T. where this Greek word for camel is used and this time it is clearly selected by Jesus to be a figurative statement where it cannot be taken literally. In this verse Jesus is talking to the scribes and the Pharisees and He tells them “You strain a gnat and swallow a camel”. These were “figures of speech” with deeper meanings that could be understood by the hearer. The gnat and the camel were not to be taken as literal statements where they were literally straining gnats and literally swallowing a whole camel. I do not have time to explain figures of speech but they are found in the Bible in several places by God’s design. What we have discovered so far is that it is not going to be easy to learn what these words really mean by observing only the usage of the Greek words in the rest of the Bible. There are no definitions for the words given in the rest of the Bible that I have found. There were no other occurrences of the words “eye” or “needle” in the New Testament. The Greek word for “camel” could be taken literally or as a figure of speech and that only means the verse in Mark 10:25 is one of the two and we need to continue to study to determine which it is. That was only one rule of Bible interpretation and there are others to follow so let’s go to the next and find how that applies. Before I apply the next interpretation rule, let’s expand the reader’s question using the implied unstated meaning behind the question. What I have discovered is that the reason for one asking a question is equally as important as the question itself. I understood my reader’s question to imply “If this verse is a literal camel going through a literal needle’s eye, then Jesus was teaching that we shouldn’t become rich, own any possessions or live outside of the realm of absolute poverty”. But was that what Jesus was actually teaching us? I have seen where many believe this to be true and go and live in a commune owning nothing. I have even heard preachers teach that this verse in Mark 10 is a proclamation that having wealth and riches in this world is a direct pathway to hell. I do not know for sure if that was the reason for the question, but that will be the focus for my answer to the question nonetheless. Is having money a negative in the eyes of God? If we own nothing is that a positive thing in the eyes of God? If having money, wealth and possessions in this world is a negative then I believe hell is full of a lot of Old Testament saints that were rich like, Abraham, Isaac, Jacob, Joseph, David, Solomon, Job and I could name others that possessed great wealth in the Bible. If the possession of wealth causes one to be evil, I would begin to ask God, why did you create it? I would then ask an even better question next to God saying “why are the streets of heaven paved in gold”? It would appear to me that the Bible contradicts the teaching that having wealth is an evil by giving us so many examples to the contrary. This is where we need to learn the application of balance. Let’s balance every verse about money in the Bible and not just focus on this one alone in Mark 10. We still need to overcome the apparent contradiction to the presumed statement made by Jesus in Mark 10:25 about a rich man not being able to enter into the Kingdom of God. Who is being spoken to? Who is being spoken about? Mar 10:17 And when he was gone forth into the way, there came one running, and kneeled to him, and asked him, Good Master, what shall I do that I may inherit eternal life? Mar 10:19 Thou knowest the commandments, Do not commit adultery, Do not kill, Do not steal, Do not bear false witness, Defraud not, Honour thy father and mother. Mar 10:20 And he answered and said unto him, Master, all these have I observed from my youth. Mar 10:21 Then Jesus beholding him loved him, and said unto him, One thing thou lackest: go thy way, sell whatsoever thou hast, and give to the poor, and thou shalt have treasure in heaven: and come, take up the cross, and follow me. Mar 10:22 And he was sad at that saying, and went away grieved: for he had great possessions. Mar 10:23 And Jesus looked round about, and saith unto his disciples, How hardly shall they that have riches enter into the kingdom of God! Mar 10:24 And the disciples were astonished at his words. But Jesus answereth again, and saith unto them, Children, how hard is it for them that trust in riches to enter into the kingdom of God! Mar 10:26 And they were astonished out of measure, saying among themselves, Who then can be saved? I gave you several verses before verse 25 and one after because they all go together in a single lesson. Jesus is the primary speaker with the majority of the spoken words being in red ink. However, there are secondary statements being made by a rich man at first and later the disciples of Jesus. Actually it is important to note that the rich man initiates the conversation and that causes Jesus to begin to respond to his question. Therefore the conversation was not initiated by Jesus. It is always important to notice if Jesus initiates something or if it is simply Jesus responding to what another has initiated. One reason for this distinction is to know if Jesus is teaching generally to everyone or if Jesus is teaching directly to just one person. This fact will have direct bearing upon how we view the context. What we have is Jesus as the main speaker answering a question from a solitary rich man not about money but about his salvation. Therefore the lesson within the conversation begins with a personal response to one man and not a general discussion to everyone about how to be saved. Do you understand this? I’ll try to say it again differently; Jesus is speaking to only this one rich man at first with the disciples in observance of the conversation not being direct participants but rather simply observant students of the Master who was giving a lesson to an isolated rich man about his personal salvation. As you can read in verse 17 the primary subject of this discussion is concerning only salvation. One of the secondary subjects of the conversation that later comes out is about the subject of the rich man’s money in verse 21. We know from reading verse 22, that Jesus was approached by a very wealthy man asking what he could do to inherit eternal life. Jesus names several of the commandments of God in verse 19 and the rich man claims to have followed all of these since his age of accountability in verse 20. Many today would think that obeying God’s law would be enough to be saved but that is not what the New Testament teaches us. In Romans 4:13-14, God says that the promise to be an heir of salvation was not given to any man through the obedience of the law but rather it came by faith in Jesus Christ alone who was doing the speaking in this lesson. In Galatians 2:16 God says “No flesh will be justified by the works of the law”. This knowledge of the law makes the initial answer that Jesus gave to the rich man almost irrelevant. So there must be another reason for Jesus making the statement. Why then does Jesus tell him that he should have obeyed the law if this obedience was not required for New Covenant salvation? Well first we need to remember that the New Covenant was not yet implemented and thus they were still under the jurisdiction and the concluding timeline of the Old Covenant. The Law was the only Words of God available to follow, so that is clearly the emphasis being given at first. However, Jesus was not done talking and continues with some personal spiritual realities on things this rich man would need to fix in order to be saved after the New Covenant was implemented. I am not sure if you understood fully what I just said, but it will become clearer as we go forward. What I observe here in this lesson to the rich man so far is that Jesus was dealing with his core spiritual heart issues and not just his perceived loyalty to obey God’s commands. Jesus appears to be confirming the existence of the rich man’s pride by offering him a chance to admit to just one law that he has not followed completely in his entire mature life. You see the law was created by God to show man that it was impossible to keep the entire law consistently and by coming to this revelation of the truth teach man the need for a savior. Romans 3:20 teaches us that it is by law that the knowledge of sin was given to man. In Romans 2 Paul talks a lot in this chapter about those under the law attempting to keep the law but then breaking it in some way. Then in Roman 5:20 Paul wrote that the law entered so that the transgression of the law might abound. I’m not sure if you understood that last statement either that God made through Paul. You see here in the U.S., the 5 largest cities with the strictest and most prolific gun control laws are where the majority of gun murders occur. If you want more deaths by guns to occur God just said you should pass more laws against them and this will cause the violation of the law to increase. Wow, that was good to learn! I wish more of our government would learn that. This rich man’s claim to have followed the law completely is a virtual impossibility since only Jesus fulfilled the law to the full extent. One problem that Jesus consistently encountered in the Gospels was religious people who believed that they were superior to Him because of their self-righteous good works. These Pharisee types looked at their ability to obey the law as the true way to God. They created manmade traditional rules on top of God’s laws to insure that they never even came close to violating God’s law. However, Jesus would look at them and say that they were like whitewashed tombs that looked pretty on the outside but were full of unclean dead men’s bones on the inside (Mat 23:27). This rich man’s response was much like those of the Pharisee types. Therefore the rich man was clearly in pride not admitting to the truth of his own faults and shortcomings in need of a savior. This is when Jesus begins to dig deeper into the man’s inner heart condition to show him that there were more profound root issues that needed correction in order for him to receive this “eternal life” that he was seeking. Jesus says to go and sell his possessions and give to the poor and that is when the rich man turns away from his only hope named Jesus in a state of grief. That was the end of that personal conversation with the rich man about his salvation and that is very important to note. Jesus then looking around about at his surroundings said out loud “how hard it is for a rich man to enter the kingdom of God”. This new statement to a totally different audience appears to be the beginning of a major controversy for the disciples of Jesus and it was totally unexpected to them because they did not understand the reason for what had just happened to the rich man. What we must observe is that a significant target audience transition has just occurred. Jesus has just moved from answering a rich man’s personal question on what he needed to do to be saved to teaching a different valuable lesson to His disciples and us in the church. This new lesson is about a greater previously unmentioned subject. What that should potentially mean to us is that the primary subject has moved from a conversation about the salvation of a single natural rich man to a conversation about spiritual internal conditions that were never discussed. Here is a good time for us to ask, why did Jesus ask the rich man to sell his possessions and give to the poor. The reason behind the request is actually again more important than the request itself. This is where the Bible reader who desires to know the truth needs to become a Sherlock Holmes type of serious Bible student to observe the details to what is really being taught to the church and not to an unsaved rich carnal man. Why were the disciples so astonished at this saying of Jesus in verse 23? Why were His disciples so surprised by this statement about the rich of this world being so hard to save? Think about it. If the disciples were all poor men that had nothing and owned nothing they should be rejoicing because they could now be easily saved on their way into the Kingdom of God, but that was not their reaction at all, was it? Can you read? Can you see what their reaction was? This was clearly the reaction of men that were NOT poor. Being shocked that a rich man is almost impossible to save makes no logical sense for anyone but men with money. I believe if you study the Bible you might agree that these men selected by Jesus were not poor men who owned nothing. In fact, the majority of the disciples described came from successful businesses that were making them money. Many were fishermen like Simon Peter and Andrew who caught and sold fish for money (Mat 4:18). James and John are described to also be fishermen with possessions (Mat 4:21). Clearly fishermen owned large boats, fishing gear, nets, as well as owned houses and worked and made money in the markets. One disciple named Matthew was definitely a tax collector (Mat 9:9) and years later when Luke wrote about this story he was described to be a doctor (Col 4:4). None of these followers were poor men begging for money to exist. That is why they are so very concerned with this statement that Jesus just made. Do you understand this? Jesus then continues the lesson saying “It is easier for a camel to go through the eye of a needle than for a rich man to be saved”. Again all of the disciples that heard Jesus were flabbergasted and confused and that confirms that they all have money. This saying of Jesus was making them think about asking if they could even be saved. What I have discovered being taught within the Bible is that the Bible is not opposed to people having money. Jesus was not teaching poverty in this example. Jesus was not even teaching that we need to sell or give away everything in order to be saved. That would be very unintelligent religious thinking that is drawn from wrong conclusions and interpretation that would teach this is found in the Bible. What Jesus was teaching, is that rich people MUST NOT trust in their money more than they trust in God. This further says that rich people must not love their money and their possessions more than they love their God. Jesus was making a point to the rich man that he needed to learn to trust in God and His Grace rather than to place all of his confidence in what he had done and what he had obtained. Any rich person who is self-reliant, self-made, and self-sufficient in their own eyes will find it very hard to be saved because they are full of pride in their own accomplishments and abilities. The Bible says that God resists the proud but gives grace to the humble (James 4:6). The rich man that came to Jesus was asking how to be saved but he was too heavily bound to and by his money and his possessions for him to let go of them to make Jesus his Lord. The rich man therefore does not qualify to receive grace. His money was in effect his god. He was joined to his money and he was unable to part with any of these temporary things of this world simply because he valued them more than he valued the eternal rewards of God and that was the major problem that Jesus was addressing in this personal lesson to the rich man. Jesus was dealing with a heart issue and not a money issue. What we value will be what we place our trust and confidence in. A man with great wealth has learned that money will buy him practically anything and he has placed a false trust in it. Jesus actually spoke of this in Matthew 6:2 when he said “Where you treasure is there will also be your heart”. Jesus clearly says what a man values in this world is what he will be focused on in his heart. Jesus is not going to share first place in your heart with your money or your possessions. Everyone is going to have to choose between Jesus and money or whatever it is that they value to determine which will be of more lasting worth and benefit and then make only one of these their priority in this life. You see when a person becomes a Christian they are required by the design of God in Romans 10:9-10 to make Jesus their personal Lord and Savior. You cannot make Jesus your Savior without also making Him your simultaneous Lord. If Jesus is your Lord then your money or your possessions or whatever cannot be your Lord. Jesus states this very clearly using money in Matthew 6:24. When someone tries to serve two masters they are distracted by the one to not fully serve either. Jesus requires your undivided attention when you make Him your Lord. He is not going to share His Lordship with your business or your money. That was the major problem with the rich man that came to Jesus in Mark 10:25. Jesus was attempting to get a commitment from the rich man to make Jesus His Lord, but the rich man turned away to continue to serve his wealth. Does this make sense to you now? Jesus was teaching the rich man about his problem without ever stating that he had a problem. When the rich man heard this he should have become humble and asked a few more questions instead of going away without knowing the rest of the truth for the reason to why Jesus asked what He did. What did I say earlier? I said the reason for the statement is as important as the statement itself. This man heard the request but did not desire to know the reason behind the statement. That was one of his greatest failures. It is not offensive to God if you ask Him questions. People are generally like two year old children to God’s level of thinking. God understands that people are in need of knowledge and understanding to grow. Asking questions is an excellent way to learn more about your situation. Don’t believe me? When the angel of God comes to Mary and tells her that she will have a child, she doesn’t walk away in grief saying, “yea right”. No she was wiser than this rich man and she asked “how shall this be seeing that I have never known a man?’ God was not angry at the question and gave her the straight answer and this was to her benefit because now she understood more about how this was possible to occur. Do you ever ask God questions? I ask God questions very often, it is the easiest way to learn the truth. Now for some more potentially controversial parts of the lesson. I have already shown briefly what the N.T. says about Jesus’ instructions concerning obeying the law so we should move to the next statement made by Jesus and learn more about this subject. Since the rich man was next instructed by Jesus to release his possessions and then to “give” to the poor it might be helpful if we understood how this relates in order to understand what would have happened to the rich man if he would have been obedient to the LORD’s request. I will confirm that his disobedience to Jesus’ request to sell and give to the poor cost him his salvation but then I will also say that it would not have been his poverty that saved him either. I’ll repeat this again, it was Jesus working on the man’s heart issues that caused the request to sell and give. I know I repeat myself, but these are important facts that need to be understood. One key to understanding a subject is to find related verses in the Bible that speak about the subject. We did this with the key words “camel”, “eye” and “needle” and found very little to help us, but that is not all of the word subjects within the context of the verse in question. We know before Jesus spoke these words about the camel going through the eye of the needle that Jesus asked the rich man to go and sell his possessions and to “give” to the poor”. I tried to teach you that this rich man was not valuing the correct things and placing them in the correct order of priority. He was clearly placing his trust in his money and possessions and that will never please God. Still there is a need to understand what “giving” has to do with God’s proposed solution to change this man’s heart around to learn to trust Him! Wow, that sounds like an awesome thing to learn for every Christian. So let’s get started. Wha t is being repeated here in this verse? I want you to first observe that this statement says the writer is working hard as an example to those that he was writing to. Therefore we just answered a part of the question about should a Christian continue to work after becoming a Christian! Did you know that the writer of the book of Acts was Luke? Can you agree that Luke heard and learned the same rich man’s lesson from eye witnesses? Did Luke learn anything from their experience? Apparently he did! Luke is saying that we should help the weak. This Greek word translated as weak means the sick, the diseased, and the feeble which implies those that are poor because they are unable to work. Everyone in a weak condition is not able to work and therefore is in need of assistance. Can we agree that this statement applies to the poor? Then Luke by the inspiration of the Holy Ghost quotes something that Jesus taught us directly. 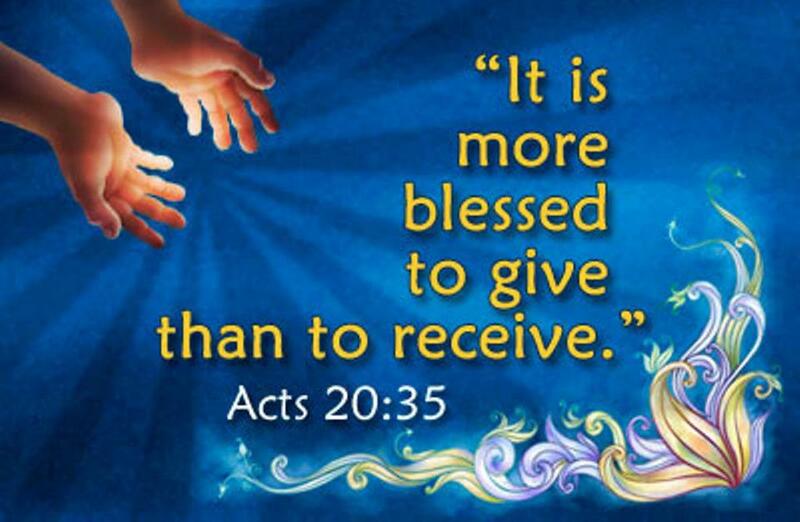 Luke said that Jesus said “It is more blessed to give (to the poor) than to receive (from the poor). I put the poor in the statement because that was the associated meaning based upon context. Do you understand that? Please tell me that you do. Why is God asking His people to help the poor, the sick and the weak by giving to them? It is primarily because the poor need the help, but God also says whoever gives will be blessed more than those that received the gift. Oh, that doesn’t make any sense does it? How is a rich man the one that is blessed by him giving away all of his money? That is a divine mystery that is being ignored in much of the church body today. What I would like you do to is to start believing that there is a blessing associated with giving to the poor. Now we just need to determine if this blessing is here in this life or is only found in the eternal rewards to come? I’ll try to answer when this giving blessing occurs by observing more about what Jesus taught us on the subject of giving in the Gospels. However I do need to review an observation of where Jesus placed the emphasis when He told the rich man in Mark 10:21 to go and sell and give. I did not go over the last part of the verse previously. If you go back and read this verse again you will notice that Jesus after telling the rich man to give to the poor Jesus then promised him that he would have treasure in heaven for doing this. That is very self-evident that there is a stated eternal blessing from God that will be given to him if he would have been obedient and had given to the poor. Jesus places the primary emphasis upon eternal rewards and that makes total logical sense to me. An eternity of blessings and treasures is far more significant than a natural 100 years of existence on earth with riches. But do not assume too much here. Just because Jesus did not emphasize any earthly benefits to the rich man does not mean that they do not exist. That would be foolish presumption to take one verse as the complete truth on the subject of giving to the poor. Therefore we need to study and find additional Bible information in order to come to a balanced conclusion. Can we at least agree that God will bless us also, if He comes to us and asks us to give to the poor? If you understand that God shows no favoritism (Acts 10:34) and what He promised to one is the same that is available to any other in the same circumstances then you should be able to agree with that belief. According to Jesus (God in the flesh), If the rich man would have only understood that what he gave to others, this verse states that God would have caused those gifts to be returned back to him multiplied. This knowledge has the potential to cause the rich to see the giving away of his riches in a much different light. Of course the rich man did not give Jesus the opportunity to teach this part of the lesson about money and giving nor did the rich man ask Jesus any questions about it. Jesus also did not voluntarily offer this information up either since Jesus wanted the rich man to learn faith and trust in God first. I’m not sure if you understood what I just said or not? God says very clearly when He asks you to do something it is for your good and not to harm, hurt you, ruin you, or even to make life hard for you. Failure to believe or understand this is one of the key reasons why people today will resist God’s instructions. This rich man in Mark 10 was not asked by God to do something that was not going to benefit him in the long run if he would have just been willing and compliant God would have rewarded him greatly for his obedience. If you believe that God is going to take something away from you without knowing the purpose behind the request then you are not trusting God’s wisdom, knowledge and plan for your life. It is usually at this point where I emphasize that you need to learn if God is directing you to turn away from anything then there is a greater purpose behind that request and if you ask for Him for the reason why, God might just show you or you can just trust Him and learn it when it happens which is usually wiser. But, it is also important to understand if Satan is trying to steal anything from you (John 10:10) you need to fight against that and resist him. If you do not know how it works yet, God will ask you usually to give something up voluntarily, but if you refuse this can open the door for Satan just to come and take it from you without asking. It is pretty simple to learn which is which. Let’s go back and talk some more about Luke 6:38 and Mark 10:21. There is a stated law of reciprocity that is placed in effect with God when a human in faith participates voluntarily and willingly with the requests of God. God is not going to ask anyone to give away something without observing the obedience and blessing them in return. We clearly saw this stated in Mark 10:21 when Jesus informed the rich man that there would be treasure in heaven awaiting him for his giving. Then again in Luke 6:38 God says if you give to men, men will also give back to you. Reciprocity is also found in the established decree of God called the Law of Sowing and Reaping (Gen 8:22). Sowing is the stated release of a seed from your hand into the ground that is believed to be given back to you multiplied over time. I believe that if the rich man would have viewed the release of his money into the poor as a seed sown that it would have been returned back to him multiplied based upon what Luke 6:38 taught us. God states this clearly in Luke 6:38 when He says that others will return to you what you have given away as multiplied. This is a very basic farming concept where any seed planter sows their valuable seeds that are returned back as a greater and more valuable return after time has passed. This multiplication principle is implied in Luke 6:38 in the phrase “good measure, pressed down and shaken together and running over”. That certainly makes it sound like giving to others is a benefit and not a liability to me. If you don’t understand the concept of seeds in the Bible I would recommend that you go read that lesson series (Understanding Seeds in the Bible). We should still understand that in Mark 10 that Jesus was not emphasizing this sowing and reaping part of the lesson simply because He was dealing with the man’s love for his money and possessions. Do you understand the motivation for Jesus telling the rich man to get rid of his possessions and give to the poor, now? If the rich man would have just considered this old fact written by Solomon probably one of the richest men ever in the Bible, I believe that it could have made a tremendous difference in his attitude towards giving to the poor. You see this verse literally says that when we give to the poor the Lord observes it and takes over the responsibility for the debt. Therefore we do not expect the one that we gave something to, to give back to us anything in return even in the future. This is simply because God says “I owe the debt” and I believe God is faithful to repay it. If God takes the responsibility for the debt, then we must ask is this repayment now in this life or is this in the next life to come? I believe that we could get correct answers for both beliefs, by saying all of the above. I do not place any limitations upon what God wants to bless me with or when God wants the blessing to arrive. Since I’m not God He can sovereignly do as He pleases. I definitely believe that there are eternal rewards based upon what Jesus taught in Matthew 6:20 when He taught that we should be laying up treasures in heaven where moth and rust will never corrupt them. But the balanced counter to that statement was given to us in Luke 6:38 that claims if we give to men (here and now) that men will give back to us (here and now). Luke 6:38 is clearly talking about receiving a return for giving here in this life. I’m not going to teach this part of giving anymore in today’s lesson. I really do not know how many I have offended by even mentioning it. Christians often ignore vast parts of scripture thinking they are not applicable for today. However to those like me that believe in them they still work just fine. I will end this section about giving by saying that there are definitely heavenly rewards laid up for us for everything that we give here on the earth so the eternal benefits will by far outweigh any temporary benefits that we can enjoy for a short time here on this earth. You should always keep your focus on the eternal rather than the carnal temporary, as I try to do. In conclusion I will say that there are certain Bible teachers who teach that the “eye of the needle” was a figurative type for a city gate designed to be very narrow to limit passage into the city. This was done in Bible days as a safety measure to keep large foreign armies and enemies from invading the city in mass numbers. This narrow gate was like a funnel that kept the inflow and outflow of traffic to a very few with limited size of restrictions that were easily controlled. This city opening was so narrow that many times a fully loaded camel would not be able to even enter it. The merchant or traveler would usually have to unload the camel and squeeze it through the gate and then carry the loads by hand into the city. So many teachers today believe that this was what Jesus was talking about in this verse in Mark 10:25. We have more directions being given to the church in these passages. God is speaking to the church and telling them not to associate with those that are in the world. Uh oh? That sounds serious to me! Then God lists a few types that fit that description. Read these again and tell me if you see the rich man being described? I’ll help you by pointing you to two key words. The first word is “covetous”. This Greek word means a human with a desire for more of something. This type of person has a very difficult time at releasing anything. I believe that description fits the unsaved lost rich man. Since the rich man was unwilling to give away any of his possession that implied that he loved them greatly and possibly desired (coveted) to even have more of them. It was like he was a collector of natural things. Any collector that I have ever observed is never satisfied with their collection. Most collectors are looking for more of the same whether it be coins, stamps or baseball cards. This “covetous” word is a problem if you are wanting more natural possession and not more of God. Again remember that Jesus said you cannot serve two masters. The second Greek word in this sentence describing the rich man is “idolater”. What is an idolater? This is a person that worships a manmade object. Uh oh again for our rich man! It is very clear to me that this rich man placed too much emphasis upon his possessions. They had become his focus and they are clearly manmade objects of temporary status. Do you understand why Jesus asked him to sell them now? I could give you many more Bible verses on this subject but I have gone long enough today. What I believe about Mark 10:25, is that Jesus was speaking of a literal camel and the literal eye of a needle with a human trying to pass this large beast through it. That would be a nearly impossible task and that was the message being communicated to the church, but not to the rich man since he was not present to hear it. Therefore, we should take this verse literally and see that the salvation of a rich man is a nearly impossible task. However, we also need to balance that message with the fact that it was not the money that caused the problem but rather the love of the money that was at issue. Jesus was clearly motivated by the heart condition of the rich man and tried to show him that the money and possession were his lord. Know that Jesus deals with individual heart conditions differently. Only man looks at the outward and sees a rich man and believes that he should be poor to be saved. God looks at the man’s heart motivation for being rich and if it is for his love of these objects it will become the area that God will attempt to correct in our lives. Each person is unique to God and only God knows what is taking priority over your relationship to Him. What God tells me to get rid of will almost always be different than what God will tell you to get rid of. And if you believe that God will never instruct you to get rid of anything then you are either deceived or a perfect person in need of no savior. Jesus was teaching that it was impossible for anyone here on the earth that was rich to be saved if they did not put aside their love for their money to make Him their Lord. While this is impossible for most men to do, we know from reading the Bible that with God all things are possible if we believe (Mat 10:27). So a rich man can be saved if they want to learn how to enter through Jesus who is called the narrow gate in Mat 7:14. Remember what Jesus said there in Matthew 7? Jesus declared there were only two paths to choose from. One narrow way was describing the selection as Jesus to be your Lord. The other choice was a wide gate and a broad path and many there are that will choose it to their destruction (Mat 7:13). This was a description of worldly lusts and desires that take the place of Jesus. Please don’t allow something so temporary like money or possession be the reason for selecting the wrong path as this rich man in this lesson did today. Thank you for your time reading and studying the Bible and until next time may you continue to grow in the knowledge of Jesus Christ our Lord and Savior.